Kim koala was tired of eating eucalyptus leaves. "Why do I have to eat these all the time? I want to eat something different," Kim complained. She climbed down from the top of the tall tree that she lived in and began to walk long through the bush. Kim spotted Kip Kangaroo hopping through the trees. She shouted, "Kip! I’m on a walkabout. I’m looking for something different to eat. I’m tired of munching eucalyptus leaves. What do you eat?" Kip stopped jumping and showed her some leaves. "I eat these shrubs." "They don’t look very tasty. Never mind, Kip. I’ll see you alter," and away she wandered. Percy platypus was swimming about in the billabong. "Hi Percy! I’m on a walkabout to find something different to eat. I’m tired of eucalyptus leaves. What do you eat?" she asked. 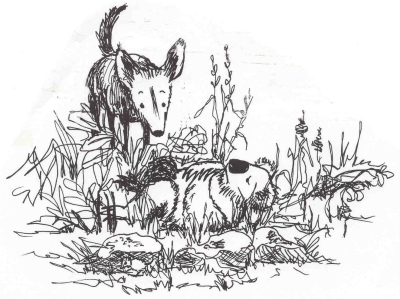 Percy climbed out of the water and wobbled on his webbed feet towards her. He opened his duckbill to show Kim. "These are delicious to eat. Would you like to try one?" "Snails?" Kim gasped. "Those look horrible to eat. Never mind, Percy. I’ll see you about," she said and wandered away, leaving the platypus. He slipped back into the water and swam away. Kim was beginning to tire so she lay down in some grass to rest. "Why, if it isn’t Kim koala. G’day to you," she heard. She opened her eyes and saw Dusty dingo staring at her. "G’day Dusty. I’m on a walkabout. I’m tired of eucalyptus leaves. I stopped for a rest. What do you eat every day?" she asked. Dusty let out a howl. "I love to eat things like mice and rabbits. I’ll fetch some tucker for you, mate, if you’d like," Dusty offered. Kim would never eat a mouse or a rabbit. "No thanks, Dusty. I have to leave now," Kim said and went on her way. She was getting very hungry. She’d not eaten anything since the night before. She was sitting under a gum tree when she heard a rustling sound above her. She looked up to see Kallie Kookaburra. "G’day Kim," Kallie laughed. "What are you doing out here in the bush? Are you on a walkabout?" Kim sighed. "Yes, I’m on a walkabout. I am so tired of eating eucalyptus leaves. I was looking for something different to nibble on. Are the leaves in your tree tasty?" "I don’t know, Kim. Occasionally I eat leaves, but I prefer spiders, ants, and snakes," Kallie said. "Never mind. I don’t think I’d like to eat spiders," Kim said. Before she left, she ripped a leaf off Kallie’s tree and chewed it. Quickly she spat it out. "That tastes horrible." She walked away with her head hanging low. Soon she came to another billabong. It was huge. The water looked cool and refreshing. She cupped her paws and took a drink. 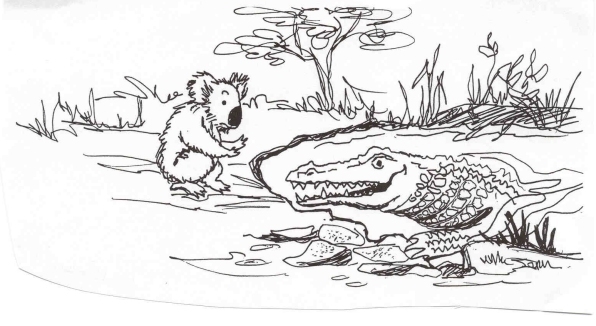 Just then Caleb crocodile stuck his big, scaly head out of the water. "Oh, it’s you, Kim koala. What are you doing at my billabong? 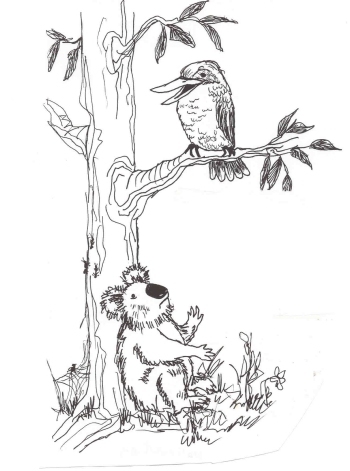 Why aren’t you in your eucalyptus tree? Is something wrong?" 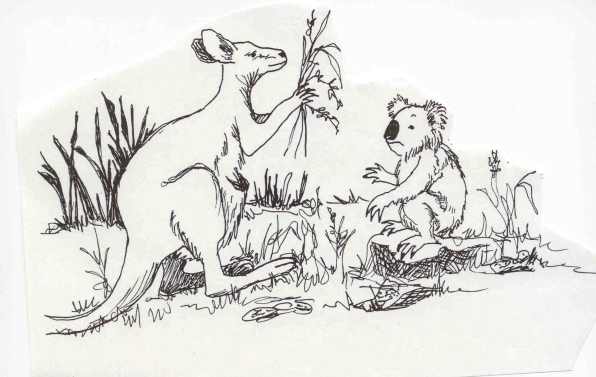 "I am tired of eating eucalyptus leaves so I decided to go on a walkabout. I was hoping to find something better to eat. What do you eat, Caleb?" Kim asked. Caleb smiled, his huge teeth shining in the sun. "Perhaps you’ve forgotten that I eat a lot of things, but my favorite thing to eat is soft, furry koala bears." Caleb was just teasing, but Kim was frightened. "Well, so long for now, Caleb. I must continue my walkabout. See you again sometime, maybe," she said, shaking with fear. None of the things her friends ate sounded good to Kim. She didn’t like snails, or spiders, or snakes, or gum tree leaves. "I think I’ll just go home," she said. Her tummy was rumbling with hunger. 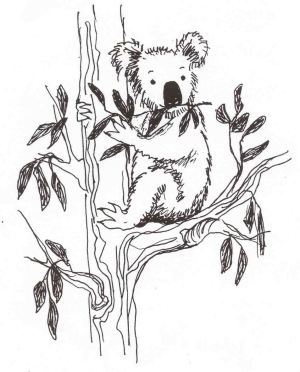 She climbed to the top of the eucalyptus tree and ripped some of the tender leaves off with her sharp teeth. She chewed slowly. They tasted delicious. "I guess leaves aren’t so bad after all," she smiled, and ate branch, after branch, until she was full.